This remarkable photo of a humpback whale breaching in front of Campbell River, B.C. was on the July 1st front-page of the Courier Islander newspaper. 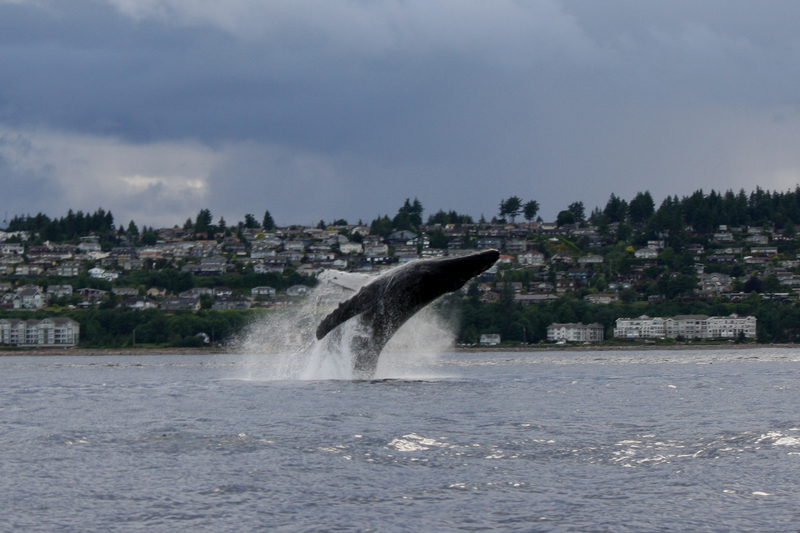 Humpback whale breaches in front of Campbell River on June 24th. Remarkable photo by Caylin Dubé - Oak Bay Marine Group. As someone who has been working to ID the humpbacks around northern Vancouver Island, I almost jumped as high as that humpback when I saw the photo! I took up contact with the photographer, Caylin Dubé of the Oak Bay Marine Group, hoping she might have images from the June 24th encounter that would allow me to determine who the humpback was. Caylin was extremely generous with her photos, wanting to know who the whale was as much as we at the Marine Education and Research Society (MERS) did. My hunch was quickly confirmed. 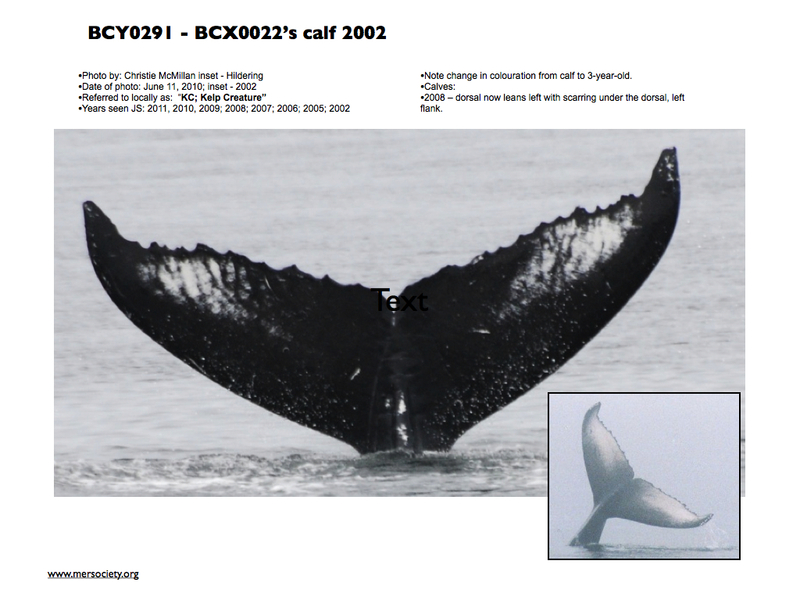 The ID work of the last 8 years allowed us to conclude that the breaching whale is BCY0291 (DFO catalogue number) who we have nicknamed “KC”. KC is short for “Kelp Creature” but the origin of that name is too long a story to explain here! We have known this whale since it was a first year calf off the waters of Telegraph Cove in 2002; an area for which this whale has extremely strong site fidelity. However, since last year, KC has also been sighted around Campbell River, only to quickly turn around and swim back to the waters around Telegraph Cove. We have theories about why s/he might do this but generally – it’s an additional mystery. Although the humpbacks are long-studied and easy to identify as individuals, there is still so much we do not know about these giants that breath the very air we do. For example, KC likely belongs to the population of humpbacks that go to Hawaii to breed in the winter, yet no one knows how the whales navigate to the Hawaiian Islands. From the MERS humpback ID catalogue. Fluke ID for BCY0291 aka "KC". Click to enlarge. From the MERS humpback ID catalogue. Flank IDs for BCY0291 aka "KC". Click to enlarge. Caylin’s photos also revealed that there was a second humpback with KC. Even without a photo of the underside of the tail (the easy way to identify humpbacks as individuals since the markings and trailing edge of each whale is unique), MERS dedication to also cataloguing flank photographs of the humpbacks allowed us to determine the second humpback very likely was “Arial” (BCY0767) who we also have known since a first year calf in our area in 2007. Very interestingly, these two whales have the same mother but since humpback calves only stay with their moms for a year, to our human knowledge they would not know they were siblings. That these two humpbacks sometimes travel together could be coincidence or not – yet another whale of a mystery to try to solve. That we at MERS were able to identify the whales from Caylin’s photographs (taken from well beyond the 100 m that boats must stay away from whales) is testament to the value of the great community effort to understand the return of humpback whales to our waters. We have ID photographs dating back to the 1980s thanks to the relentless vigilance of Dr. Alexandra Morton to understand our marine ecosystem. 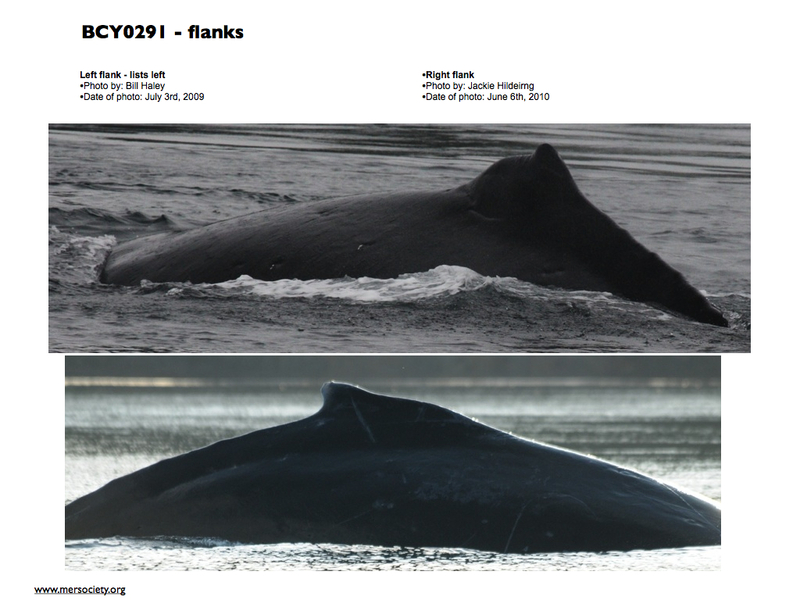 Many other ID photographs have been contributed by the whale watching community from Port Hardy to Campbell River (of course taken when following the Be Whale Wise guidelines). Of special note for the consistency and longevity of their contributions is Stubbs Island Whale Watching. For the work of the Marine Education and Research Society, including our efforts to understand the threat of humpbacks becoming entangled in fishing gear, see www.mersociety.org. Below, I include a few more pictures of KC, including the most entertaining ID photo we have ever received – a photo of KC heading in the direction of Campbell River passing the Spirit of the West Adventures kayaking camp. 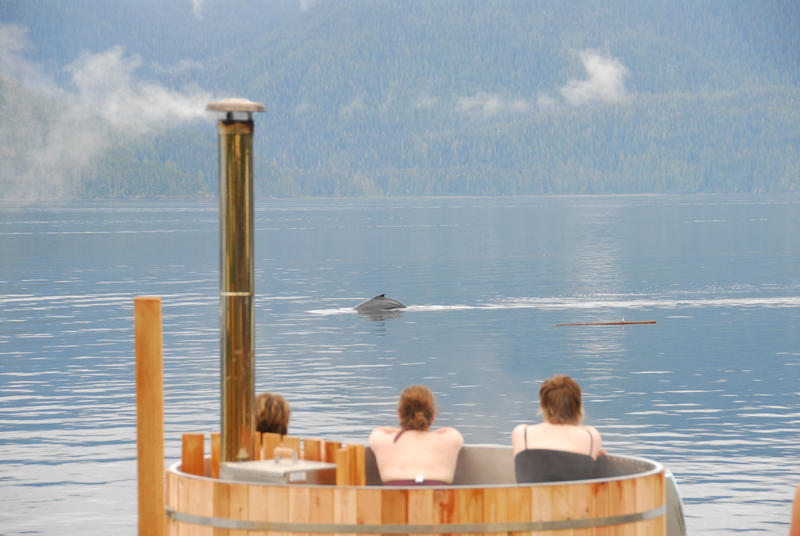 Note the happy humans-in-a-hot-tub in the foreground! Photo by Rick Snowdon of Spirit of the West. KC heading in the direction of Campbell River in 2010, passing the Spirit of the West Adventures kayaking camp. Photo by Rick Snowdon. Click to enlarge. Thank you Carol for making sure I know about that clip. As beautiful and heart-warming a story as this is, I have been shy to promote it. The way the whale was disentangled is not “professional” and carried high risks. Likely the method of disentanglement was the best option under those circumstances but not what should be put out as the procedure, protocol or messaging for disentangling humpbacks in our waters. Thanks again for ensuring I knew about it.